"To go back is to admit defeat, and face worse defeat to come. If we go back now, then the Ring must remain there: we shall not be able to set out again. 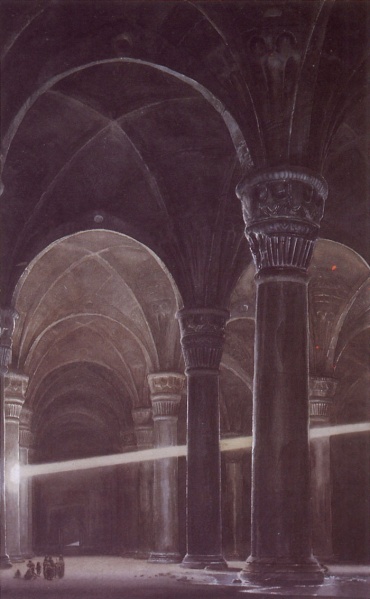 Then sooner or later Rivendell will be besieged, and after a brief and bitter time it will be destroyed." Only way in fact is one that neither Gandalf nor Aragorn want to attempt. Going around the long way would take too much time and has too much risk while they have the Ring. 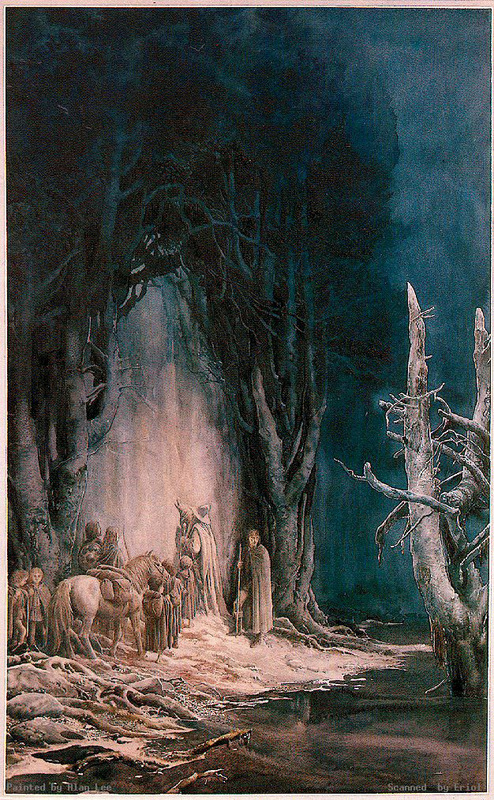 Once their path is revealed, no one particularly cares to enter the Mines of Moria, with Boromir near refusing, but Aragorn knows of some threat to Gandalf in particular. Out of the entire party only Gimili has a vested interest in exploring Moria, and it's not a mission of much hope. The detour itself is less than safe, some 15 to 20 miles while wargs are about. We are treated to a rare ostentatious display of magic by Gandalf, who tends towards generally subtle applications of magic and deception. Before now we've had little direct mention of the hostility between dwarfs and elves, but here we learn that once strong friendship existed between the two races. A friendship that waned for reasons each blames on the other. Later in the chapter we learn of the true value of Moria and the mithril found within. The greed of dwarfs is mentioned in delving too deep and unearthing Durin's Bane, but I think we'd be amiss to not also note the greed of the elves. Dwarfs may have mined the ore and built their wealth upon it, but crafting of mithril is associated almost exclusively with the elves. Our party also loses its first member. Bill the Pony must be set free to find his own fate. Sam is most distraught at this separation, but logistically the loss of a pack pony is quite significant. Now that I think about it, it's a bit optimistic that they only have one pack animal for this journey. Gathering food while one travels takes quite a bit away from ones speed. The door riddle remains one of my favorite moments in the book. Tolkien introduced us to dwarf doors in The Hobbit, but for that they used a key. This door presents a riddle, one with a delightfully cheeky answer (to be honest, don't all the best riddles have cheeky answers?). Like their attempt to cross the mountain, creatures and the land seem against their quest. Wargs hound them to the mines, a creature of many tentacles latches on to Frodo, once within the mountain their exit blocked by stone fall, and the water in the Mines unpotable. Nothing bodes well for the expected 40 miles through the mines they face. Adding on to the growing dread, we learn that changes are coming over Frodo. The text implies the changes coming over him are since the wound received from the Wraith, but I don't want to discount the effects of the Ring which has been tied to changes in physiology in a previous bearer. Dark vision and sensitive hearing also developed in Gollum. I do think the wound and the Ring complement each other's efforts. The scenery in the film is, as always, gorgeous. Even when we're looking at barren rocks and withered trees. The gate itself is no exception, even if the moon-script was a bit too detectable without moon's elimination. The stairs of Moria make no sense, since we're talking about the halls of a short people with correspondingly short legs. The stairs left are way too steep and with too narrow of a tread. Jackson has given Frodo a bit more intuition here, registering both the riddle and the answer. Hobbits are quite fond of their riddles, so it's not without president. Frodo also picks up on Gollum's presence much earlier, spotting his skulking form in the shadows. Gollum in this story was not known to be an escaped prisoner, with Legolas purely as an envoy and not as a messenger of bad news. His presence and the following discussion to give rise to very significant insight by Gandalf. That Gollum may yet to have a significant part in the fate of the Ring, and that pity is not to be scoffed at. Gimili is excited about the entrance, expecting to find friends and family. It's not until they enter and find the corpses of dwarven defenders do the dangers of the mine emerge. His optimism and hope is all out of place with the attitudes of the journey and the book. On the other hand, greater hope means greater grief, which was likely the intent. Even if it's not depectied as a four day journey, Gandalf's words give us that time frame - which I greatly appreciate. The film compresses time again and again, and now that they are inside a mountain we lose even the markers of night and day.